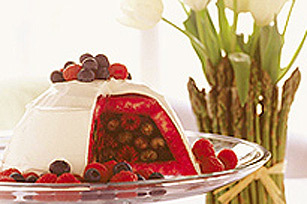 Turn fresh picked berries into a stunning no-bake dessert. Just follow our 3 simple steps to a summertime showstopper dessert. LINE 2.5L bowl with plastic wrap. Line bowl with slices of white bread with crust removed. DISSOLVE 3 pkg (85 g each) Jell-o Raspberry Jelly Powder in 3 cups boiling water. Pour 1 cup of the dissolved jelly powder over bread to cover completely. Stir 2 cups of jelly into 5 cups frozen berries until slightly thickened. Pour into bread lined bowl. COVER completely with more bread. Pour remaining jelly over bread making sure to coat bread. Cover with plastic wrap and refrigerate 4 hours or overnight. Turn out of bowl and frost with 2 cups Cool Whip Topping to serve.